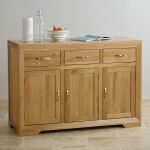 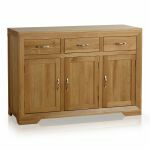 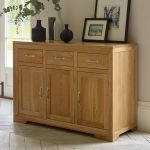 The Bevel Natural Solid Oak Large Sideboard is a highly-functional unit with a refreshingly simple design. 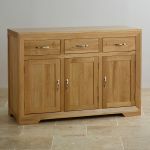 Made from beautiful solid oak timbers, it is characterised by the bevelled frame with mitred joints and gracefully angled feet. 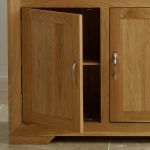 The two doors on the left side of the unit open to reveal a conjoined cupboard space, while the remaining conceals a height-adjustable shelf for taller items. 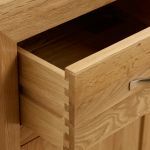 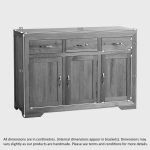 The three large drawers are ideal for storing linen or cutlery and have all been made using traditional dovetail joints with solid hardwood backs and bases. The brushed metal handles complement the natural lustre of the oak and give this unit a very contemporary air.